In December 2013, Ducky Momo visited Disneyland during Christmas! And he wore a festive Christmas hat! We got to Disneyland at 7am for early entry. 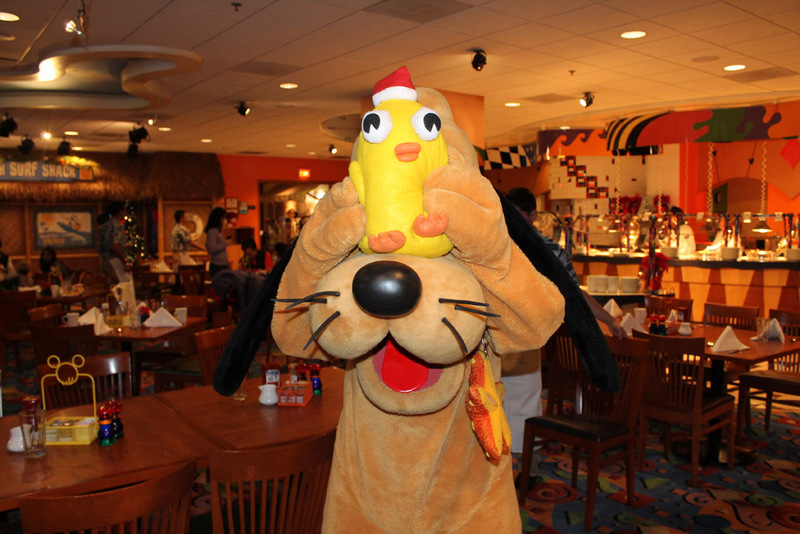 Once the lines started getting long we went to the PCH Grill at the Paradise Pier hotel. Our daughter loved meeting Stitch so much last year, we knew this would be a hit, and successfully kept it a surprise. My daughter this year got her own Ducky Momo backpack (handmade by my wife), and she put her stuffed Stitch into it. 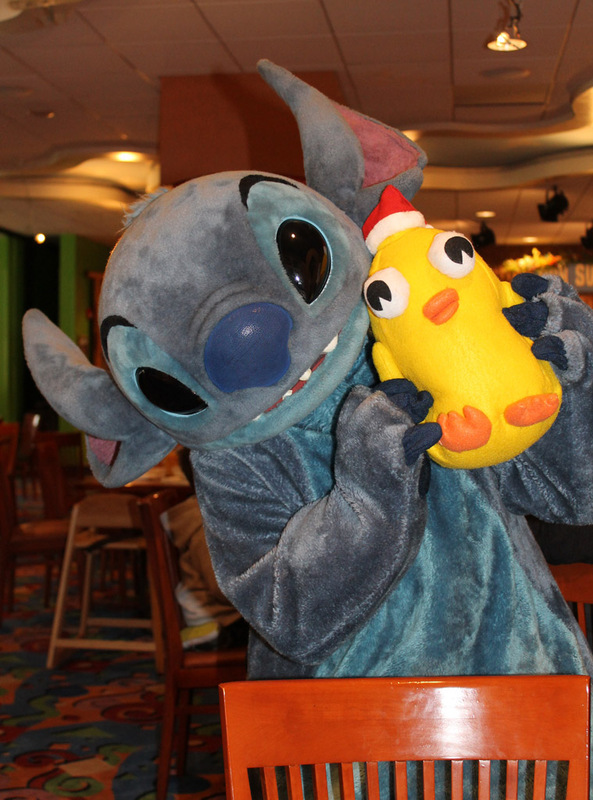 When Stitch saw his tiny doppleganger, he started to grab him and run off… but he came back, and was more than happy to pose with Ducky Momo. 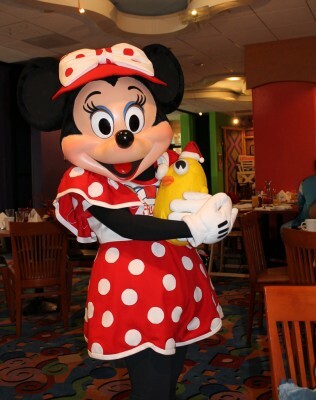 Minnie Mouse came to our table and was very sweet. 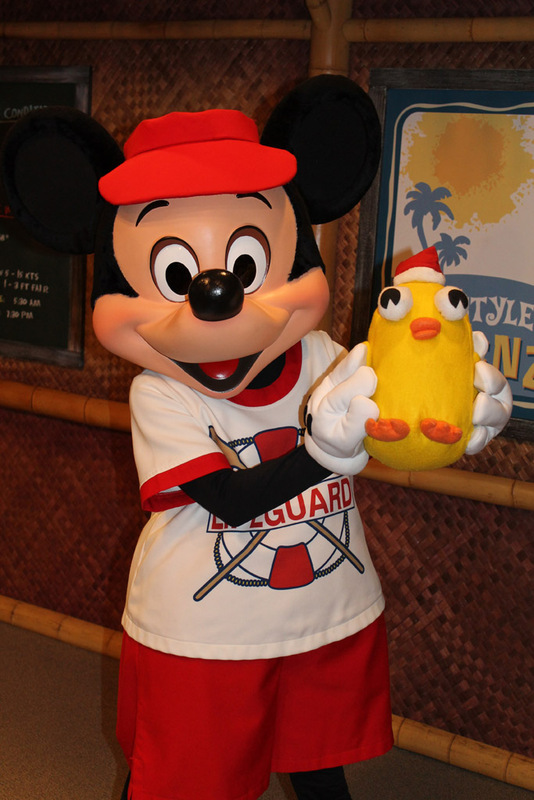 She cradled Ducky Momo like he was her baby. 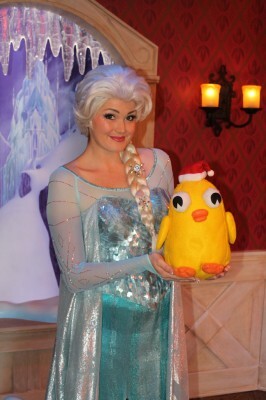 Daisy Duck came by while I was away, and my wife didn’t get a Ducky Momo picture. We were all done eating but they had been telling us for a long time Pluto would be around, so we stayed until he did come out. I probably ate more bacon than I should have while waiting. 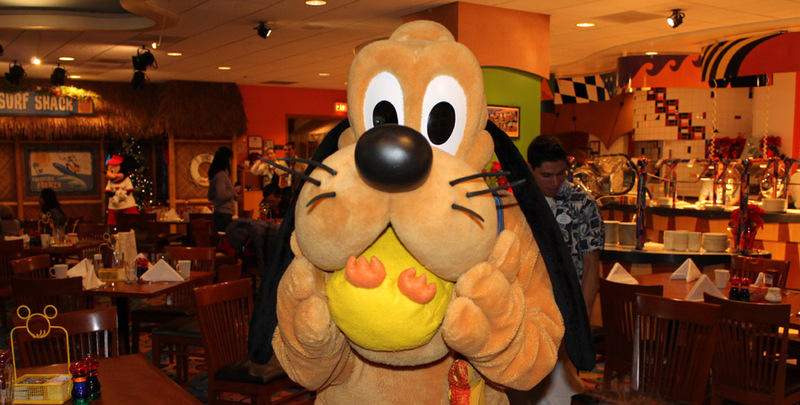 We’d never met Pluto before so this was pretty fun. I’ve still never met Daisy. 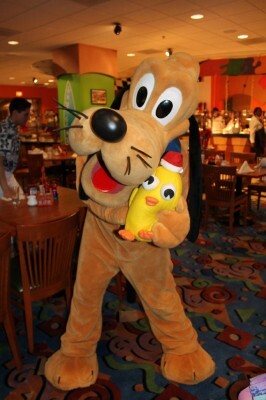 Pluto really loved Ducky Momo. 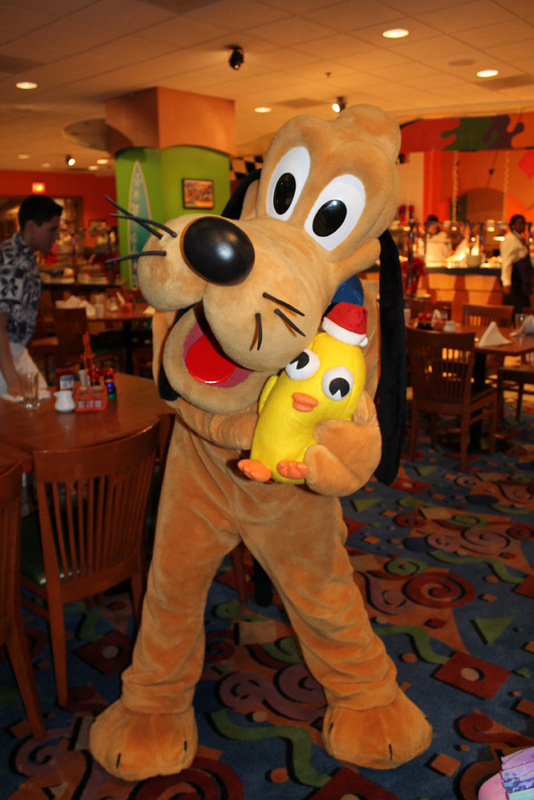 Pluto loved Ducky Momo a little too much! On the way out we met Mickey. We’d gone up to do their dance party a couple of times while eating, but this was our photo op moment. 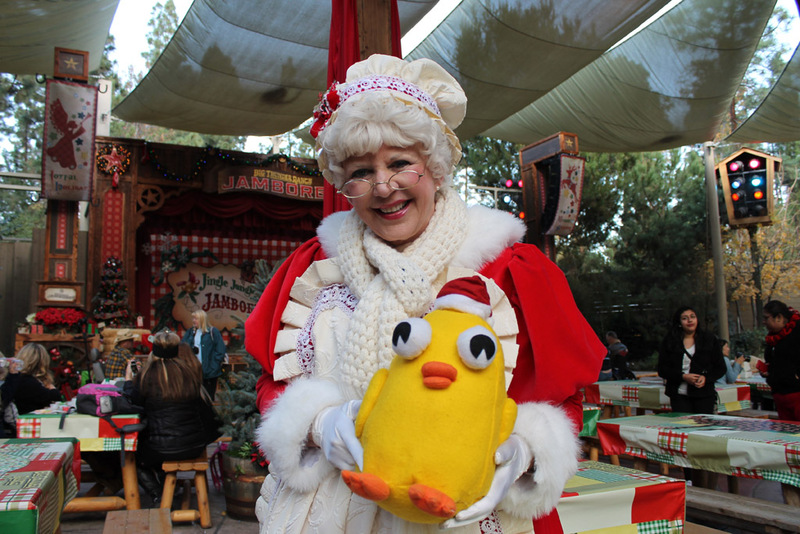 Back at Disneyland, we went to the Jingle Jangle Jamboree in Big Thunder Ranch. We did the cookie decorating kits as a way of taking a nice break from the crowds, and Mrs. Claus came by the table. 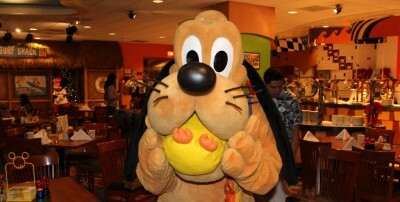 Goofy was around too but we didn’t get a good opportunity to see him. After seeing Mickey and the Magical Map, this friendly trio of Ducky Momo fans stopped to say how much they loved my backpack. 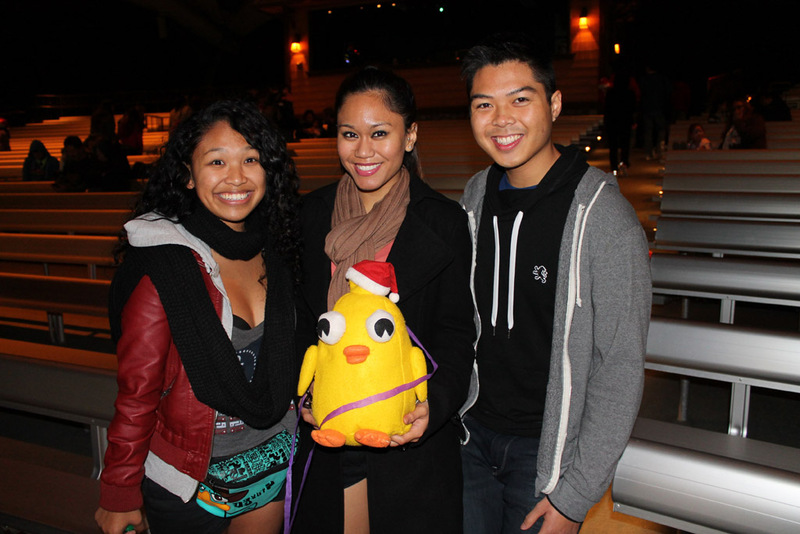 I surprised them by pulling Ducky Momo out of it. The nested Momos are always a hit. They had a fourth member of the group that wasn’t with them and missed out on this momentous and thrilling opportunity. 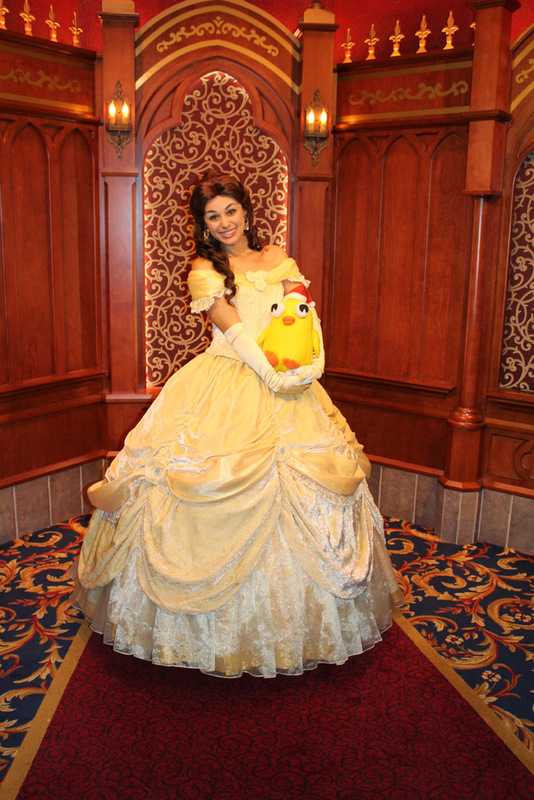 Shortly thereafter, this young lady, Grace, also noticed my backpack, and I was again able to astound someone by producing Ducky Momo from within it. Her friend had not yet learned about the Momosity of it all, and was perplexed by good-natured by her enthusiasm and my apparent insanity in having a Ducky Momo inside a Ducky Momo backpack, while wearing a Ducky Momo T-shirt. 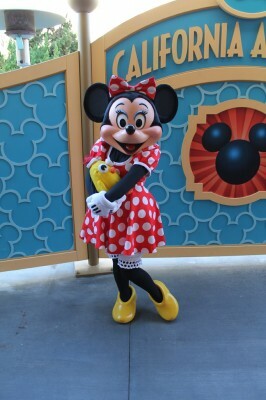 On Monday we went to Disney’s California Adventure. Disney Visa cardholders have a special Meet and Greet in DCA. We’d already met Minnie at the PCH Grill, but here, she’s wearing just a bow instead of a hat with a bow! That makes all the difference. Officer Calvin Blue wanders Buena Vista Street and writes citations for good behavior sometimes. I didn’t get one, but I saw a little girl get one. 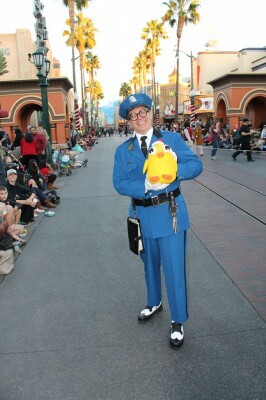 I accosted him right before the Pixar Play Parade started. 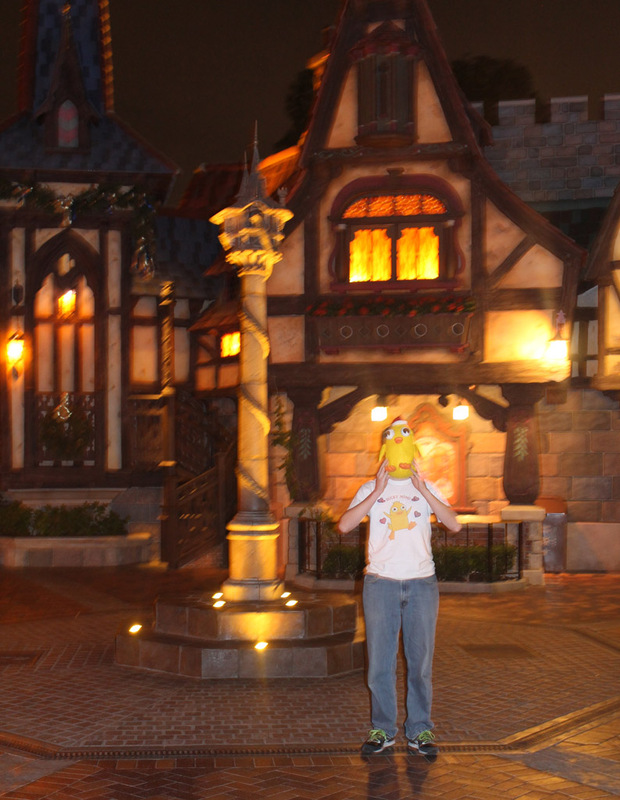 On Tuesday we went back to Disneyland. I of course love the Disney Fairies. I wore my Pixie Hollow T-shirt I made, and my daughter had a matching one. 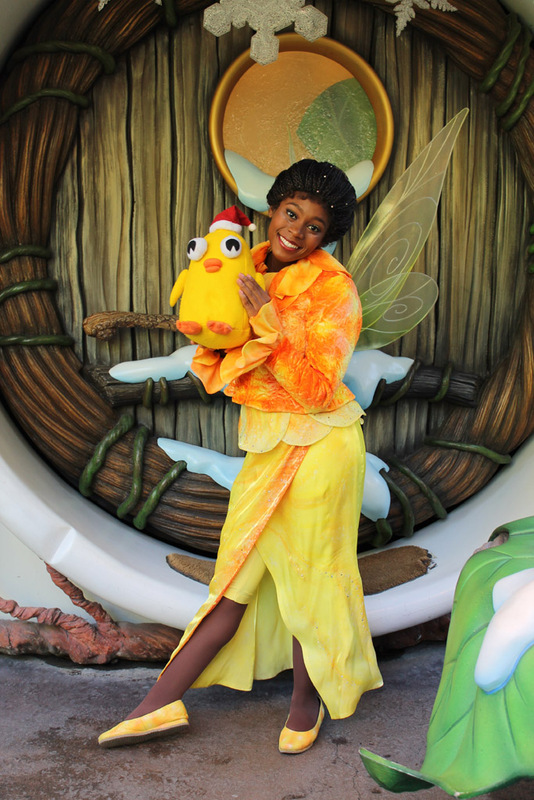 Tinker Bell didn’t exactly know what to make of Ducky Momo but did like my shirt and Tinker Bell shoelaces. Iridessa was very sweet. If I was a fairy, I would be a light talent I think. In real life I’m more of a tinker though. 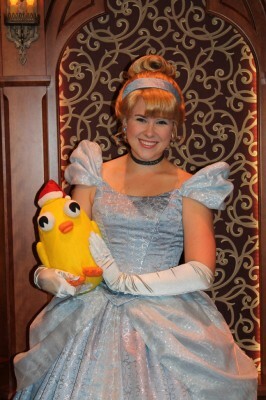 My daughter went to the Bibbidi Bobbity Boutique. 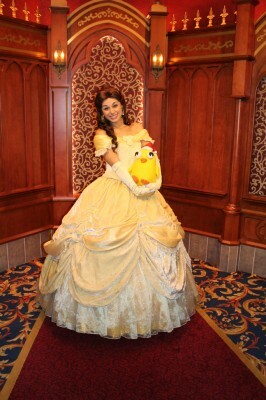 We got the package that let us skip the 70-minute line at the Royal Hall and see the princesses. But since they were all out of Elsa dresses from Frozen, we didn’t actually have to buy the dress/wand/crown items to get the Castle Package. 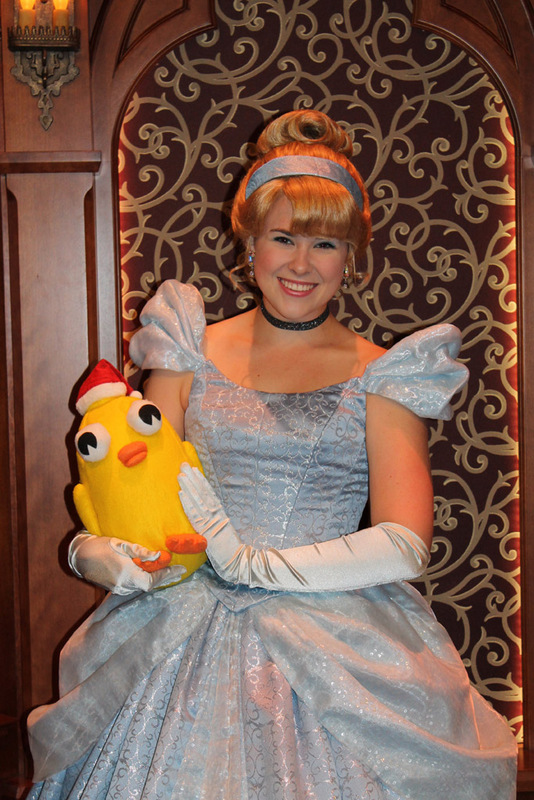 Cinderella is a little more used to mice than ducks, but they still got along well. 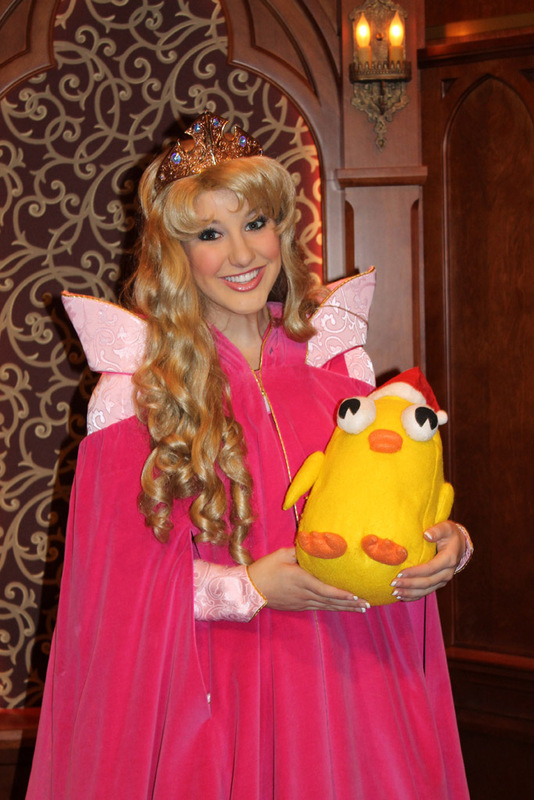 Belle didn’t judge Ducky Momo for being provincial, so they got along splendidly. After a two-hour wait, we got to see Queen Elsa, the newest Princess from the movie Frozen. I believe there were equal amounts of Anna and Elsa merchandise, but Disney apparently was surprised that Elsa merchandise was MUCH more popular. My wife found an Elsa dress at the Disney store before we left. “Oh, we have to get the dress as part of the package at the Boutique,” I said. But what if they don’t have any left, she asked? “Oh, I’m sure they’ll have plenty,” I said in one of the more foolish statements in my life. We bought the last Elsa dress at the Disney store, along with Anna boots (that’s what our daughter wanted, instead of Elsa slippers). 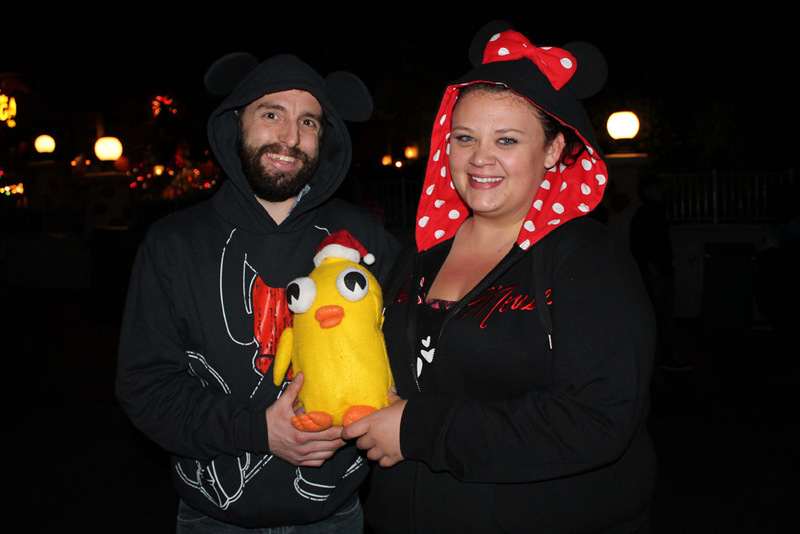 We figured we could always return them if Disneyland had what we needed. Disneyland, of course, had no Elsa dresses left larger than a size 3 and no more until MARCH. So my wife’s planning ahead really worked out. I saw maybe 2 or 3 other children in Elsa dresses the entire trip. 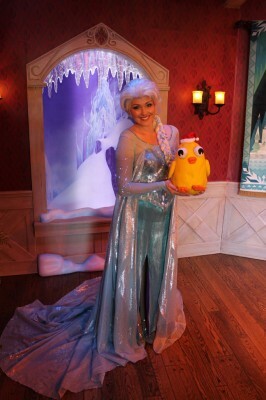 Elsa, of course, has overcome her fear of her power and was delighted to hold Ducky Momo without her gloves. My wife volunteered to stay in line all over again to meet Anna. 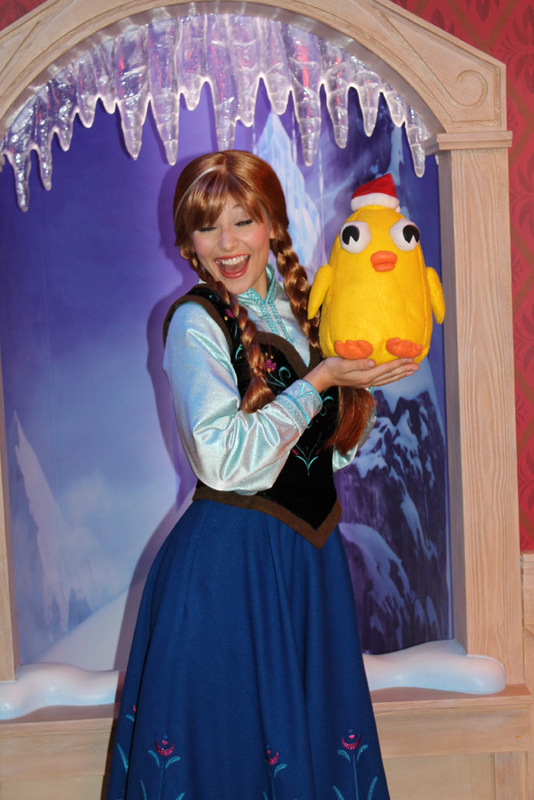 Anna thought Ducky Momo was totally awesome, which, of course, he is. 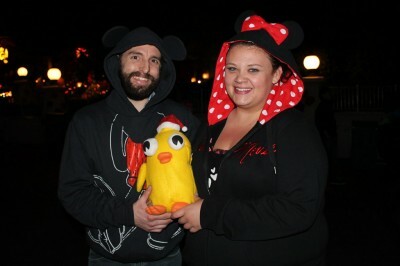 Our last night at Disneyland. After six packed days, our daughter fell asleep in the stroller, and proceeded to sleep through a practically front-row seat at Fantasmic! How she slept through the music, fireworks, cannons, and dragon roaring is amazing to me. 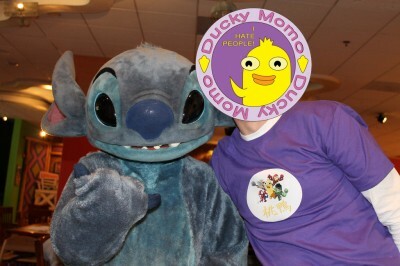 We all wore our original Ducky Momo T-shirts on the last day. On the way out, I got this picture in front of the Royal Hall. 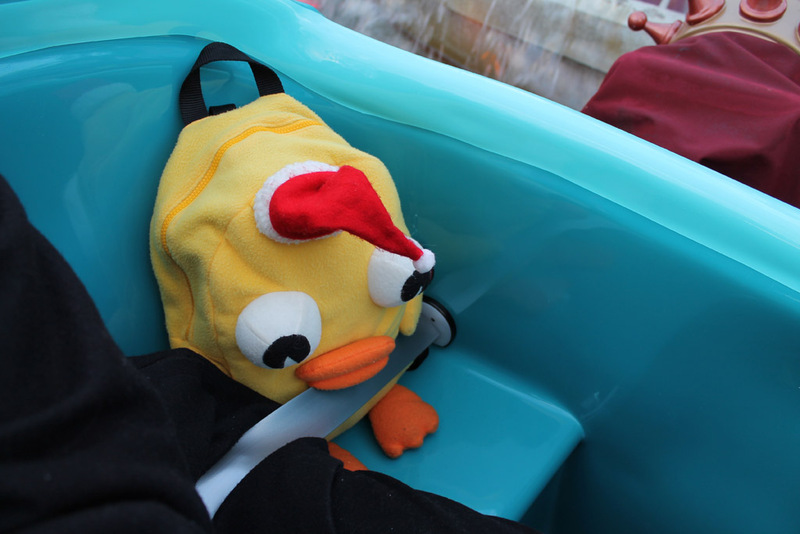 This is my Ducky Momo backpack also with festive Santa hat. He rode with me on Dumbo because my daughter wanted to ride with Mommy. I love your photos! Your wife is very talented. I am tempted to try my hand at making a Duckey momo for my grandson, for Christmas. Mason has one but, it is smallish and expensive. Thanks for sharing you fun with Duckey momo.